Don Blue – World Champion (1974) - IGX "...overflowing with foulmouthed ignorance." For many years I had heard a great deal of praise for a young man, lifting from the Kansas State Penitentiary. 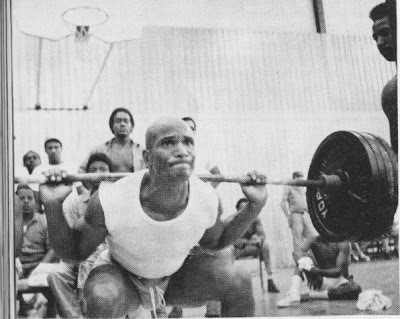 People had repeatedly invited me to come down to observe one of the contests held in the penitentiary so that I could see this young man and his outstanding lifting. It always seemed that business kept me from attending one of these meets when they came up, and I therefore had been unable to observe this phenomenal lifter. Don Blue recently obtained a transfer to the Nebraska State Penitentiary and is now looking forward to a parole and an opportunity to live on the outside. Don has recently, repeatedly, broken the world deadlift record in the Lightweight Class, and a while ago he had the opportunity to travel to the World Championships and win the Lightweight Powerlifting title. Immediately, when I mention that he has been in the penitentiary, people ask “Why?” Don Blue is not reticent about telling you why he is in the penitentiary. He states that he got in with some bad company and was influence to go along with them in their larcenous schemes. It was difficult for him to learn better and he was in the Kansas State Penitentiary twice. He tells me now that he is completely reformed and as soon as he is paroled he expects to go into youth work and help other young men avoid the pitfalls and temptations that were his own downfall. I am sure that Don has a great future in this work. He has a very magnetic personality and is full of enthusiasm for the work that he plans to do. I have watched him lift at many meets recently and observed his progress in ascending the ladder to the top in the powerlifting field. It was interesting and enlightening to interview him for this article and he has some very interesting ideas about training which probably differ somewhat from the majority of training programs used by most powerlifters. Certainly Don has proven the efficiency and effectiveness of his training methods which I will detail later in this article. Don was born in Buffalo, New York, and his mother is French-Canadian, his father American. He had two uncles who were prize fighters and one of his mother’s brothers was a carnival strongman, so he has a background of athletic accomplishments in his family. He comes from a large family with 11 sisters and 1 half-brother. Don became interested in training in 1960 while in prison and made very rapid progress from the time he started. His first lifting was done at a bodyweight of around 140 pounds. Bill Clark, district chairman of the Missouri Valley District, encouraged him to get into lifting after observing Don do an easy deadlift of 500 pounds the first time he ever tried it. I well recall Bill’s enthusiasm as he wrote me about this sensational find for the lifting game. When a man is so naturally strong in a certain lift I always try to look into his background to see if this had something to do with his ability. Don tells us that before his prison experience he worked on a transfer handling freight, boxes and equipment. This, of course, could have contributed to his strength, but we feel that he had a tremendous amount of natural ability to start with. His present work in the Nebraska State Prison is working in the dairy, and his job is to raise the small calves which are a constantly increasing obligation. Don enjoys this very much and feels it is constructive and worthwhile work to take care of these young animals and help them grow and prosper. He has told me that he has had them lifting weights, and all joking aside, it would not surprise me to hear Don had contrived some way to have these calves lift, simply because of his great enthusiasm for Iron Game. Don is presently 29 years old and single, and still has many years of progress ahead of him should he be able to continue his weight training as he has in the past. I ought to state here that although he is not concentrating on bodybuilding as such, he has a very fine physique and has won quite a number of contests recently. It was difficult to encourage him to enter these physique contests as he felt very self-conscious about it. After the first few he became enthusiastic about it and seems to enjoy them very much. His posing routine is very unusual and rather rough, but as it smoothes out he will ascend higher up the ladder in the physique world as well. Calves are his only weak point and probably very little can be done about this. Apart from this he has a superb physique. I asked Don about his opinions on nutrition. Of course, there is very little he can do about what he eats in a penal institution, however, he did not feel the food was too bad, and he gets good variety. Also, as he has funds available he does try to buy and use supplements to make up for any possible deficiency he might experience. We imagine that many people on the outside eat a much poorer diet than what Don has been subject to in the institution. He does feel, however, that supplements have value to him and that he should take them whenever possible. Don has a bright, sunny, optimistic attitude about life and there is no worry about things that he cannot change. Don feels that rest and sleep are supremely important, however he has some unusual ideas that I think are very sound. He feels that when you lie down to sleep you should conscientiously try to attain a condition of complete relaxation of your body and mind and in this state you will rest much better and much faster. He spends some time in bed when he is not asleep practicing this complete relaxation. Many people ask Don if he has done any Olympic lifting. Yes, he did and was very good at it, however, at the present he prefers powerlifting. Should he elect to go into Olympic lifting there is no question in my mind that he could become one of the top lifters in the country, if not the world, as his Olympic lifts right now equal records in his bodyweight class of just a few years ago. In fact, right now if he chose to do so, he could probably take the lightweight title in a matter of a year’s training. He claims a press of 335. I mentioned that Don has a workout schedule which differs considerably from most powerlifters. He prefers high repetitions almost exclusively, and seldom makes maximum attempts. His workouts vary as to repetitions and sets of the various exercises. 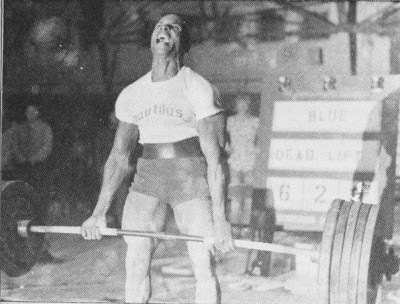 Don feels that most powerlifters have insufficient stamina to finish a contest and run out of steam before they have finished their deadlifts, and thereby fail. By working on high reps and many sets, Don has developed terrific endurance so that he is completely fresh as he finishes a contest. He never worries about being too tired to make his best lifts. Don does not include a lot of lifts or exercises in his programs, but concentrates on the three powerlifts mostly. With three workouts per week he does perhaps 10 sets of 10 reps of the bench press and deadlift on Mondays. Then 10 sets of 10 reps in the squat on Wednesdays and Fridays. He varies this schedule somewhat from time to time for variety. That is, he may do more workouts on the deadlift at times than he does in the squat or he may prefer to work on his bench press at other times. The poundages used in these many sets re not high, but as heavy as he can use for 10 reps. As you can see, there is nothing complicated about Don’s workouts, just a lot of hard work and intelligent application, but he does emphasize the value of high repetitions. He has never trained on low reps with high poundages to any extent and has mentioned that only occasionally will he attempt his maximum poundages in training. Don does sometimes change his routines for variety. He does this rather than change the exercises. For instance, he may work out for three days straight, then rest for three or four days. He feels this will break the sticking points and sustain progress better than changing exercises. He has several such routine changes which he uses on himself and on friends whom he is training. Some of these fellows who have been training for several years suddenly make progress they cannot believe when Don puts them on his programs and works them harder than they ever believed possible. Most of them have never done high reps in their exercises and were not aware that they could make such good progress on them. I’m sure this statement will come as a surprise to many powerlifters since very few of them ever did any high rep exercises, and it is doubtful if most of them would be willing to work as hard as these high rep exercises require. I have mentioned the value of high reps in the squat frequently, but most readers conveniently overlook such comments and go right on doing their old training routines. Don’s style in the three lifts is such that the officials enjoy working with him. His squats are always very low and his deadlifts are in excellent style, as are his bench presses so that there is no problem in determining whether or not his lifts are good. Either he makes them or he doesn’t make them. When I interviewed Don, his best bench press was 330 and his best squat was 470 in a contest. I understand that he has increased these, but don’t have the exact poundages, except for his current 625 deadlift. Don has several good years ahead of him and should greatly increase his present poundages and possibly maintain his top position as world champion for several years to come. I want to wish Don Blue the very best in the coming years and look forward to seeing him increase his poundages over the current best he has made.